You can support other diabetes non-profit organizations through the Tidepool Big Data Donation Project. Any time an industry partner uses Tidepool's paid dataset qualification services and your donated dataset is selected, Tidepool will donate 10% of the proceeds to a non-profit organization of your choice. For more information on the Tidepool Big Data Donation Project, please read this blog post. Step 1: Create your free account at tidepool.org/signup. Step 2: Follow the instructions to verify your account and setup Data Storage. Step 4: Select a nonprofit diabetes organization. Follow these instructions to get started using the Tidepool Uploader. We recommend setting a reminder to upload your data at least once a month to make sure you don’t have any data gaps. That's it! By participating in the Tidepool Big Data Donation Project, you're supporting Tidepool and other nonprofits that are working to better the diabetes community! Already have a Tidepool account? If you do not have a Tidepool Account, please see our article about Getting Started. After you have logged in, you may see a blue header with a "Donate my anonymized data" button. (If you do not see the blue header, see below.) Click "Donate my anonymized data", then, if you'd like to have Tidepool donate 10% of the proceeds generated by your data donation to a nonprofit diabetes organization, click "Choose a diabetes nonprofit", and select which nonprofit diabetes organization(s) you'd like to receive 10% of the proceeds generated by your data donation. Don't forget to save your settings! 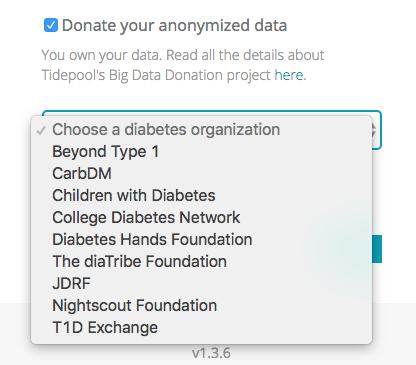 If you don't see the blue header, click on the account name at the top middle of the page to navigate to your profile settings, check "Donate my anonymized data", and select which nonprofit diabetes organization(s) you'd like to receive 10% of the proceeds generated by your data donation. Don't forget to save your settings! If you haven’t uploaded your data before, follow these instructions to get started. We recommend setting a reminder to upload your data at least once a month to make sure you don’t have any data gaps. That's it! By participating in the Tidepool Big Data Donation Project, you're supporting Tidepool and other non-profits that are working to better the diabetes community! At any time after you have opted in, you can choose to opt out of the Tidepool Big Data Donation project. If you opt in, and then later change your preference to opt out, you will not be able to remove or delete data that had been previously donated. After you've logged into your account, click on the account name at the top middle of the page to navigate to your profile settings. 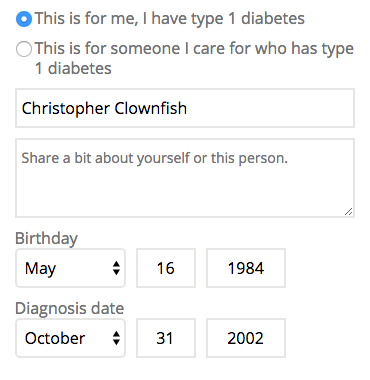 Remove any nonprofit diabetes organizations you've selected to receive 10% of proceeds generated by your data donation. Uncheck "Donate my anonymized data" and click "Save". To see more information about our Share functionality, please visit this page.